Take this cm5 event as a challenge if you’d like. Find that friend or acquaintance that boasts liking “all types of music” and use March 17th as the night that reaffirms or squelches that oft-used, off-handed assertion. We’re proud to be able to assemble this double bill to reopen the question of how you approach listening to music and what exactly needs to be familiar, even among your favored artists. After seeing a pair of UCF-TV concerts featuring the UCF Percussion Ensemble and their director Thad Anderson, we’ve been angling to include their consistently creative offerings somewhere west of their Alafaya/University outpost. They come downtown to present the Iannis Xenakis spatially-arrayed Persephassa for six percussionists. The Xenakis biography is singularly more rich than most genealogy reports. Persephassa draws in the influence of the Greek goddess Persephone; goddess of the underworld and spring growth, telluric energy coursing near the earth’s surface, Fibonacci system-derived rhythmic notation and the composer’s complementary passion for architecture. Persephassa was commissioned by the Shah and Empress of Iran for the 1969 Shiraz Festival held on the ancient ruins of Persepolis. Xenakis created the composition as part of his architectural critiques of the formal concert hall with its perceptible boundaries separating performers from audience. 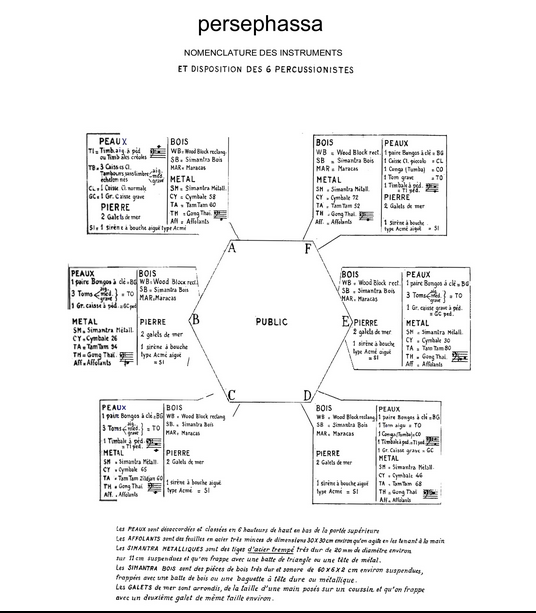 The six multi-percussion stations of Persephassa are set up in a hex pattern that was initially intended to be arrayed around a lake with the audience inside the playing area afloat on watercraft. Many of the rhythmic figures of Persephassa are imitative as well as variants as they are passed around the spatial hex. A standard two-channel recording might give you a sense of direction and depth, but a live attendee inside the area of the six percussionists will have the best possible presence to interpret the composer’s intentions. The six members of the UCF Percussion will be paired on both sides of the second story balcony, opposing sides of the mid-room floor and on the stage at Timucua white house. You will be the transducers in the middle. Our pitch for New York’s Zs is that however admirable their recorded output and performance aesthetic, they are less interested in sharing what has happened during their decade-plus existence than they are in building upon those events. The static and comfortable embrace of nostalgia- including their own earlier work- gets discarded for the celebration of evolution and perpetual motion. A present tense example is presenting site-specific multi-media shows as ambitious live remix events inviting outsiders to use the band’s decade celebration Score box as source materials. Attend their performances at Timucua and Lil’ Indies to likely hear none of that material from the current trio version with Zs veteran Sam Hillmer joined by new guys Patrick Higgins and Greg Fox. Our booking of this version of Zs is more an exercise in unknowns than knowns. The material performed could be sonorous meditations, seemingly tribalist rhythmic studies, minimalist compositional structures, no-wave lineage noisy disruptions, a combination of these parts, or something else. 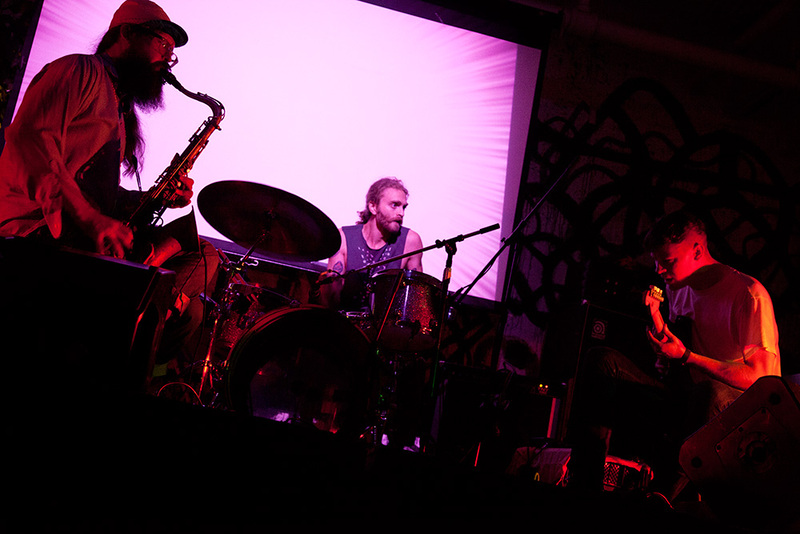 While the recorded output of Zs commenced with a mirroring tenor saxophone, electric guitar and drum kit sextet primarily performing notated, rebel modern classical compositions, the current Zs have reverted to an internalized folk process of non-notated music modified when the collective evolutionary spirit is present. We’ll witness Zs following their state of the union visit to this year’s South By Southwest conference. Expect them to amend those statements from Austin, Texas once they reach Orlando. Participate in the Timucua instant arts community created at each event by appearing willing – described by composer Anthony Braxton as the “friendly experiencer.” Timucua encourages a small plate dish and a bottle of wine for community distribution. We’ll see you there. Tags: Civic Minded 5, cm5, Greg Fox, Iannis Xenakis, Persephassa, Timucua white house, UCF Percussion Ensemble, Zs (band). Bookmark the permalink.